Iran has branded a resolution passed by the UN nuclear watchdog which paves the way for the country to be referred to the UN Security Council illegal. A majority of countries voted against Iran on Saturday, setting in motion a procedure that could end in sanctions. Iran's foreign minister said the resolution proved Britain, France and Germany acted on behalf of the US. Iran insists its nuclear programme is purely for peaceful purposes and not to produce nuclear arms as the US alleges. Foreign Minister Manouchehr Mottaki rejected the vote, branding it, "political, illegal and illogical". Twelve members of the International Atomic Energy Agency (IAEA) board abstained from voting on the EU motion. "The three European countries implemented a planned scenario already determined by the United States," Mr Mottaki said. One hundred and eighty of the 290 deputies in the Iranian parliament called upon the country's government to "abolish the voluntary suspension of peaceful nuclear activities". MP Alaeddin Borujerdi said deputies would also look into economic ties with countries that upheld the resolution. US Undersecretary of State Nicholas Burns said the vote was part of a "patient long-term strategy". "It's to isolate Iran on this question; it's to ratchet up the international pressure on Iran," said Mr Burns, quoted by the Associated Press. The British foreign secretary also welcomed the resolution. "Both the fact of the resolution and the scale of the vote in its favour are very important if we are to prevent the spread of nuclear weapons capability," Jack Straw said in a statement. The text calls into question Iran's claim that its nuclear programme is solely intended to generate energy. The head of the IAEA, Mohammed ElBaradei, has said there is still room for diplomacy. Mr ElBaradei has said the question of referring Iran to the UN Security Council should not come up before November, when the 35-member IAEA board meets again. Submitted by Britain, France and Germany, the resolution called on the IAEA board to consider reporting Iran - at an unspecified date - to the UN Security Council. It says Tehran's "many failures and breaches" over international nuclear safeguards "constitute non-compliance" with the Nuclear Non-Proliferation Treaty (NPT). Failure to comply with the NPT is automatic grounds for a report to the Security Council, under IAEA rules. Iran says its nuclear activities have not violated the NPT. The IAEA board opted to vote on the resolution rather than adopting it by consensus, its usual approach. Russia and China, which both strongly opposed the motion, abstained. Venezuela was the only country to vote against it. India, which has close ties with Iran, denied that its decision to vote in favour of the motion was due to US pressure. Iran has warned that if referred to the Security Council, it could start uranium enrichment - a possible step toward making nuclear arms - and stop allowing unfettered IAEA inspections of its nuclear facilities and programmes. 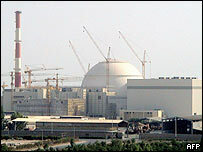 Iran concealed its nuclear fuel programme for nearly 20 years before it was confirmed by US satellite pictures in 2002. Traces of highly enriched weapons-grade uranium were found at its Natanz plant a year later. Although a recent IAEA report that those uranium traces came from equipment bought several years ago from Pakistan.